Blue skies and sunshine gave way to the first wet qualifying of the year for Voltcom Crescent Suzuki’s Alex Lowes and Randy de Puniet as the heavens opened at the Circuit de Nevers Magny-Cours this afternoon. Saturday’s two free practice sessions began by enjoying similar conditions to the previous 24-hours, as Lowes continued hunting the top-six. His lap-times consistent as he worked through his 38 laps, the British racer was confident of his Yoshimura-powered GSX-R heading into the Superpole qualifying. The curse of the Magny-Cours weather, however, had other ideas, with heavy rain engulfing the circuit just minutes before qualifying commenced. Lowes struggled to find a rhythm with his Suzuki’s wet-settings, succumbing to the conditions at the sweeping ‘Estoril Turn Three’ – his 2’02.227 lap-time placing him 11th in the times and sitting on row four for Sunday’s contests. De Puniet also fell-foul of the rain-soaked circuit, crashing at the same corner as his team-mate on his third lap of the opening Superpole session. His previous lap-time of 2’06.621 left the French racer ninth in the session and places his Suzuki GSX-R1000 19th on the grid for his two 21-lap home races tomorrow. 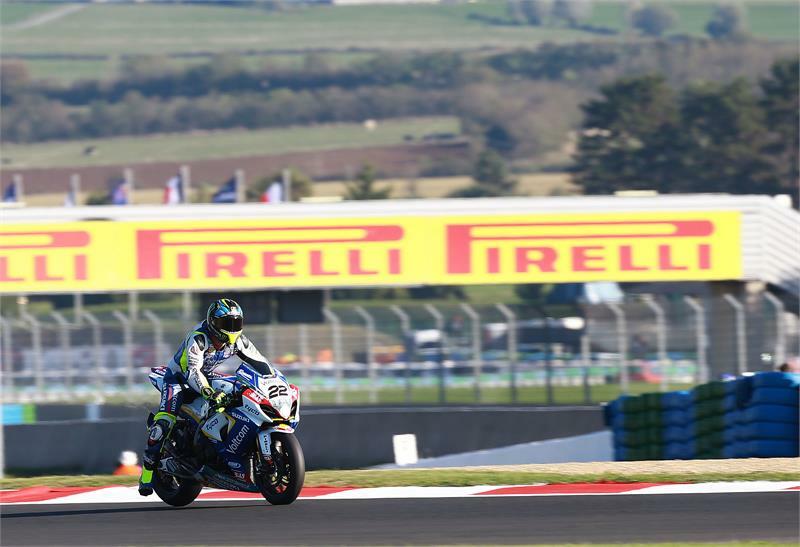 Magny-Cours– eni FIM Superbike World Championship – Superpole: 1. Leon Haslam (Aprilia) 1’56.404: 2. Jonathan Rea (Kawasaki) +0.004: 3. Niccolo Canepa (Ducati) +0.508: 4. Chaz Davies (Ducati) +0.645: 5. Sylvain Guintoli (Honda) +1.435. 11. Alex Lowes (Voltcom Crescent Suzuki) +5.823: 19: Randy de Puniet (Voltcom Crescent Suzuki) SP1.